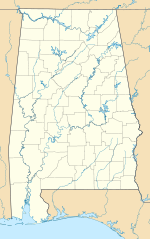 Cullman Regional Airport-Folsom Field (ICAO: KCMD, FAA LID: CMD, formerly 3A1) is a public-use airport located five nautical miles (6 mi, 9 km) north of the central business district of Cullman, a city in Cullman County, Alabama, United States. It is owned by the City and County of Cullman. Folsom Field covers an area of 90 acres (36 ha) at an elevation of 969 feet (295 m) above mean sea level. It has one runway designated 2/20 with an asphalt surface measuring 5,500 by 100 feet (1,676 x 30 m). For the 12-month period ending July 28, 2010, the airport had 37,830 aircraft operations, an average of 103 per day: 99.7% general aviation and 0.3% military. At that time there were 57 aircraft based at this airport: 86% single-engine, 5% multi-engine and 9% helicopter. Skydive Alabama, a civilian skydiving center, is operated out of Folsom Field. Skydive Alabama (SA) is a United States Parachute Association (USPA) affiliated drop zone that operates year-round, maintaining a Beech 99. Most skydives take place from an altitude of around 14,000 feet, but high altitude jumps from 18,000 feet are commonly made with the use of supplemental oxygen. SA maintains USPA certified instructors on staff to provide tandem and Accelerated Freefall (AFF) training for beginning skydivers, as well providing coaching, rigging services, gear sales and rental, and camping areas for experienced skydivers. ^ a b c d FAA Airport Master Record for 3A1 (Form 5010 PDF). Federal Aviation Administration. Effective August 25, 2011. ^ "2011–2015 NPIAS Report, Appendix A (PDF, 2.03 MB)" (PDF). 2011–2015 National Plan of Integrated Airport Systems. Federal Aviation Administration. October 4, 2010. Archived from the original (PDF) on 2012-09-27. ^ "2009–2013 NPIAS Report, Appendix A: Part 1 (PDF, 1.33 MB)" (PDF). National Plan of Integrated Airport Systems. Federal Aviation Administration. October 15, 2008. Archived from the original (PDF) on 2011-08-06. ^ a b "Skydive Alabama". Dropzone.com. ^ "Skydive Alabama". Official site. This page was last edited on 26 November 2018, at 21:49 (UTC).